Favorite Fall Hair Accessories for 2014! We are so excited that it is finally October! Fall is my favorite hair accessory season! We’ve rounded up some of our favorite accessory trends we’ve been seeing so we think are going to be HUGE this fall season! 1.) 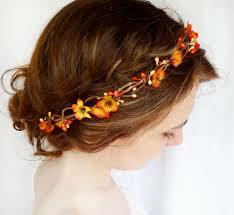 Floral headbands/hair pieces - First off, we love these ALL the time but we love them most in the fall! All of your typical fall colors work perfectly with pretty much any hair color and can take any outfit from drab to fab in seconds. These can be purchased but are even more fun and affordable to make yourself if you have a craft store nearby! 2.) Headbands in general - We’re loving the big bulky headband comeback thats been going around! This trend is a no brainer for anyone with a hectic schedule! Headbands are everywhere and also super easy to make. They can be used for casual and formal looks but are crazy fun to use for messy up-do’s when you’re running late! 3.) As always, braids, braids, braids - We’re loving the braided crown trend for fall but we are loving it even more when there is some extension work involved! I’ve been loving all of the chocolate-woven blonde braids I’ve seen and vice versa. What an easy way to spice up your average braid! ← How To Get the Most From Your Deep Conditioner!